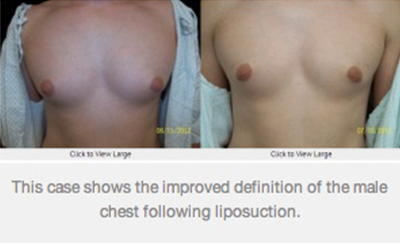 This case shows the improved definition of the male chest following liposuction. The benefits of liposuction go far beyond just removing fat. While not a solution for weight loss, liposuction can significantly enhance body contours for a patient at or near his or her target weight. Deciding where to have liposuction will depend on your aesthetic goals, but here are some things to keep in mind before scheduling your surgery. may be able to enhance existing hourglass curves. Surprisingly Effective Target Spots There are other areas that you might not think of as being treatable with lipo, but even some of these less common target areas can dramatically improve your overall appearance. The undesirable “double chin,” which can give the neck an old or heavy appearance, is a perfect example of the kind of exercise-resistant fat that can be effectively addressed with lipo. Many men choose lipo for their chest area to help give them a slimmer look and to accentuate muscle definition. No matter which problem spot bothers you enough to send you to a liposuction specialist, choosing the right surgeon is the single most important decision you will make. The best practitioner will have the expertise to explain whether or not you’re a good candidate, when it’s the best time for you to schedule liposuction and what kind of results you can realistically expect.